Addon to capture location and contents of books in game. With this addon being as old as it is, and the last post being over three years ago, I am unsure if it is still being supported. None the less, hoping that someone sees it and can update it I'm going to post an error I just received after trying to open a book after 8.0.1 hit. Thanks. 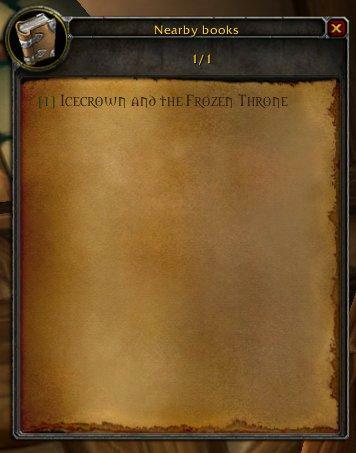 Hello, I've recently been getting into RP with my blood elf and I've been looking for a stand-alone addon that does exactly what this one does, but it doesn't appear to collect text anymore (though, there doesn't appear to be any other issues). So I post to show that there is someone who is still interested in this addon I've not had much luck finding another addon of this type and I hope perhaps there might still be interest in an updating it. This AddOn still seems to work for me. I do remember that each time I reinstall it I have to hunt down the settings for it as they are set to not save the books or flip the pages automatically by default. You can get a list of commands in game by typing "/bw help" and you can check the current settings by typing "/bw". I just tested this in game on my character, so I know it still works. If it still isn't working, you might check to be sure you are loading out of date AddOns. 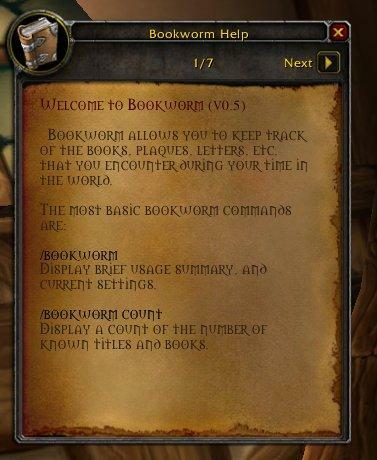 If you like this AddOn, there is also a BookWorm Extractor (http://wow.curseforge.com/addons/project-1298/) that allows you to save the books as text files for browsing outside of the game. Been a few years since I used it, but it worked well when I did. Still looking forward to the new look (hopefully its still coming)! I would love an interface that is easier to use/easier to browse books in. Just posting an encouragement and a hope for an update! Are you still working on that new look? Bookworm is one of my add-ons that still works pretty well with 4.0.3 even though it hasn't had an update for a while. But in June I saw that you had posted that you were working on an update that would change the way you could browse/view books - something that I am looking forward to using. TOC update for Cataclysm aside - any info on when your upgrade might posted? Without this add-on I'd have to use precious bag space for books that I don't need most of the time. I'd really have a hard time without it. I'm actually surprised that Blizzard hasn't implemented an internal feature to handle this. Its there an Update in work?? I'd love an update for this, too. Any chance for an update? Love this addon, and its worked great so far, although I did encounter a bug in the DK starting area. 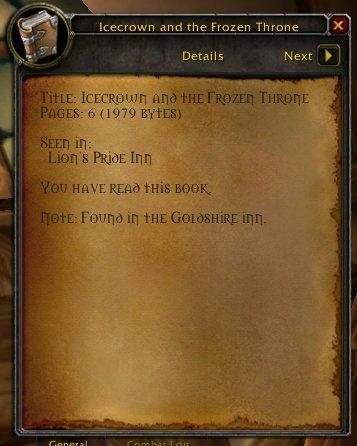 For some reason, some of the books in the hold are missing pages (usually its page 2). Some books wont even open beyond the first page - but certain books give me a bookworm error (the same ones I'm having trouble reading). Not sure if that's BK's fault or not (probably isn't). Anyways, I look forward to any update you can provide. Great addon! Love being able to read books I've seen anywhere, in a "Library" I can carry around with me without carrying around an actual... library. Goodness knows I don't have room in my bags for that many books anyways. Just wanted to say this is a great add-on and would LOVE to know if it will be updated to reflect the new locations for books that will be shifted, etc. with Cata. Here's another prod from a fan really looking forward to an update! I also would LOVE to see this updated. 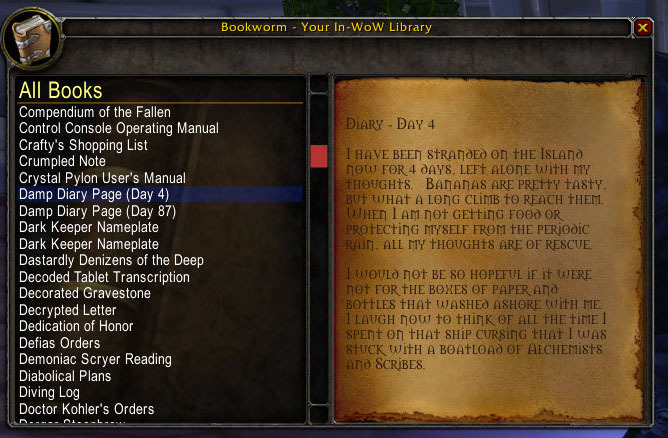 I signed up for an account on WoWInterface just to come here specifically and tell you that I am eagerly looking forward to the new version of Bookworm. I've been very sad with the new game updates and no bookworm to follow. I'm looking forward to an update.